Wondering how to teach your kids about print awareness? Try these brown color-coded tall letters pocket chart cards. 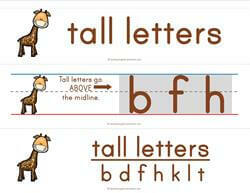 The tall letters are represented by a sweet tall giraffe to show kids that the tall letters are written so that they touch both the top line (in most cases) and the bottom base line. This page includes three landscape cards: one with just the words “tall letters” and the giraffe, one with a visual description of how tall letters fit on primary writing lines, and lastly, a card with the title “tall letters” and all the tall letters. Use these with the sets of letters in our tall, small and fall letters page. Print these cards on card stock so they hold up longer, cut them apart and laminate if you want. Go to this page to see all the resources in this tall, small and fall letters set.